I regularly see bunches of roses marked down at the supermarket to next to nothing, and I used to think 'who'd buy those...they'll be dead tomorrow!'. Well now I know who....me...and you...because this is the most gorgeous way to use them. 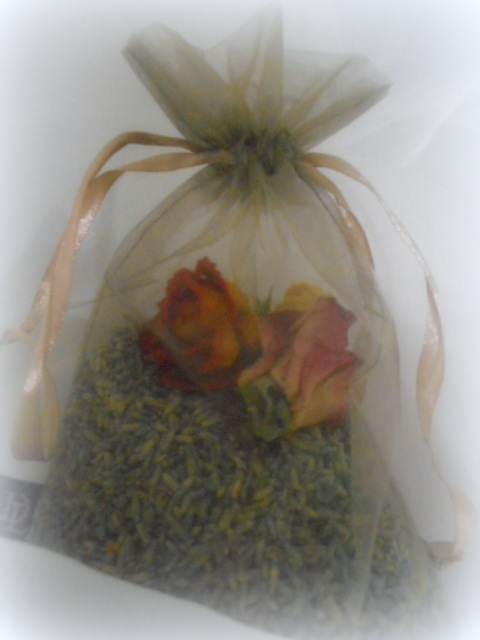 They don't have to have a scent either, because they mainly make your potpourri look pretty, so choose colours you love. The more vibrant the better because they will fade over time. Strip them of their leaves, tie some kitchen string or ribbon around them, and hang them upside down somewhere for a couple of weeks until they're crisp and bone dry. You end up with these lavish looking multi coloured dried rosebuds, or petals, depending on what you purchased. This was clearly a bunch of roses featuring a variety of colours, and I just adore the combination of the fiery orange, delicate mauve, deep burgundy and pastel cream and pink. You see lots of complicated recipes for Potpourri on the net and in crafting books, but I've always found that a simple combination of dried lavender and dried roses or rose petals, gently tossed together, with a little essential oil to freshen it occasionally, is all you really need. 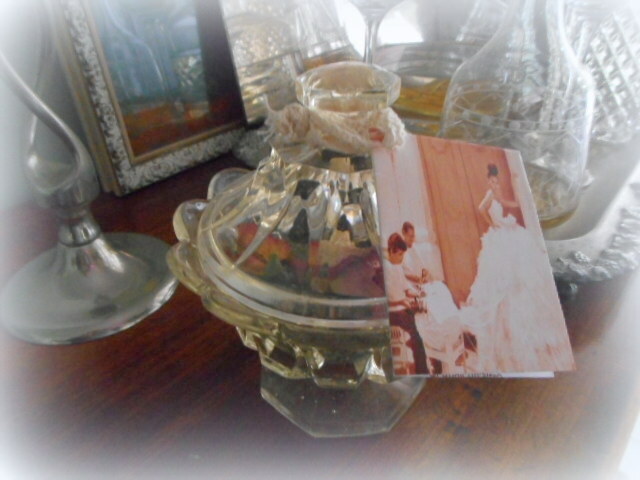 ....it's also very pretty scooped into organza bags for gifting or tying on doorknobs or looping over coathangers. Thankyou for sharing Mimi. I'll give your recipe a go when I dry some lavender. Well, how pretty is that, Mimi? I would love to have roses growing here but my hubby doesn't like them at all unfortunately. The State Rose Garden is not far from here so I can drool over the roses there. 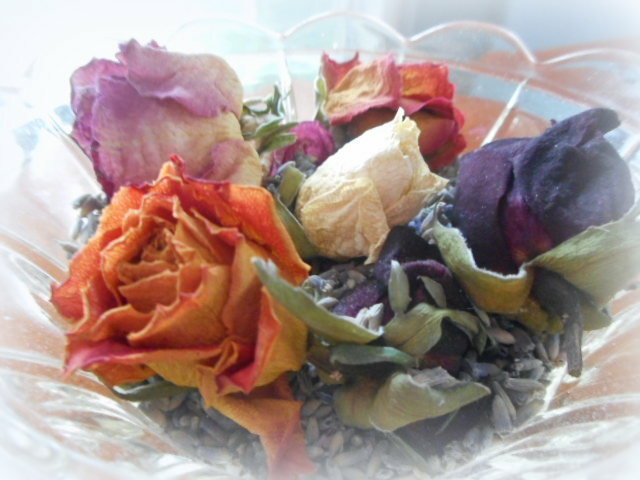 I haven't made potpourri for ages. It must be time to give it another go. Simply beautiful, is what I have to say about it! Great idea, Mimi dear. What a fantastic idea Mimi. 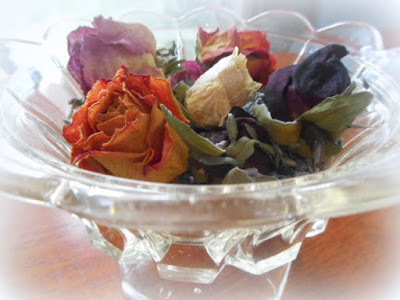 I have never thought to buy reduced flowers for making potpourri. I know I will be from now on, such a lovely gift idea too. I love this idea, thank you. Visiting from Ivy and Elephants.